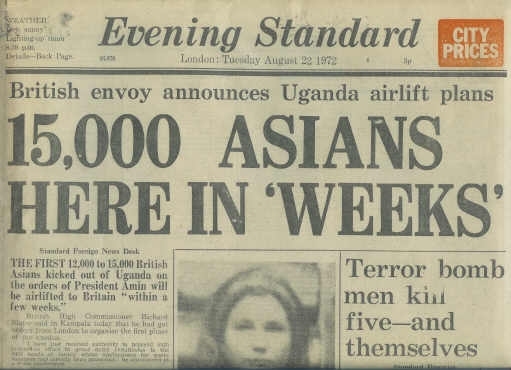 THE FIRST 12,000 to 15,000 British Asians kicked out of Uganda on the orders of President Amin will be airlifted to Britain "within a few weeks". British High Commissioner Richard Slater said in Kampala today that he had got orders from London to organise the first phase of the exodus. "I have just received authority to proceed with immediate effect to grant entry certificates to the 3000 heads of family whose applications for quota vouchers had already been processed," he announced at a Press conference. "That's to day they were already in the queue, and their documentation is complete." He explained that they would be leaving "in a matter of weeks rather than days" because their documentation would have to be given a final check, and the Asians concerned also have to wind up their affairs in Uganda before they left. This would require them to obtain tax clearance certificates, and in some cases to register their businesses with the Ugandan authorities. In addition, the Uganda government had to decide how much money they would be allowed to take with them. Said the High Commissioner : "I don't think we can expect a mass movement in a very short space of time, but it should be clear by tomorrow morning that we are making a start." What of the rest of the 50,000 or more British passport holders among the 60,000 Asians who have until November 7 to get out of the country? "The remainder will just have to wait patiently until we can call them forward as and when arrangements can be made," said the Commissioner. The airlift of the first to leave will be largely done by charter aircraft and they will have to pay their own fares. Reception centres would be set up in Britain "because the Asians have to be processed on arrival," said Mr Slater. But he hoped there would be no need to house them in transit camps. "Most have relatives and resources of one kind or another in the United Kingdom." Normally the absorption of 12,000 to 15,000 would take between two and three years. How rapidly would Uganda process the tax clearance and other formalities? "I am in touch with the authorities, although we haven't got a working committee going yet," said Mr Slater. About 20 consular reinforcements would soon be flown to Kampala to help the British mission. And what about those Asians holding Ugandan citizenship who are now being made stateless, but who at one stage held British passports? "They will have to be considered case by case ... it will take a long time," replied Mr. Slater. A SPECIAL council meeting of Ealing Borough Council is to be summoned to consider the Ugandan refugee question. Tory members want the Government to make it abundantly clear to Asians "who may initially be contemplating settling in the borough that they will be faced with great difficulties if they do so." They also want the Government to "take all steps open to it, including, if necessary, the provision of financial assistance to induce these refugees not to settle in this borough."